Pluralsight is a leading web-based solution that offers tech and creative training for professional individuals. The platform offers a vast selection of video training courses for software developers, IT administrators, and creative professionals via its website. Pluralsight offers users a number of options for searching their course catalog. The solution has a number of basic courses to help novices learn fast from scratch, as well as advanced topics for IT professionals and developers on the job. 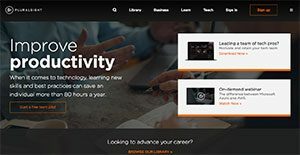 On top of already having a huge library of courses, Pluralsight subscribers are given access to the complete catalog of courses at Digital Tutors, a site strictly intended for design software, and creative professionals. Pluralsight is an online training provider that gives users access to comprehensive and cost effective selection high quality learning materials and training courses for a monthly fee without requiring them get into any to long-term contracts. For businesses, the system is a platform that can provide your team with expert-authored, on-demand video training and powerful learning tools to keep their skills sharp and updated without spending too much and compromising business operations. For experts, Pluralsight lets them join their author network and share their expertise and knowledge with learners worldwide. Every enterprise is different, and can require a specific Learning Management System - LMS solution that will be designed for their company size, type of customers and staff and even particular niche they deal with. We advise you don't count on finding an ideal services that is going to be suitable for every business regardless of their background is. It may be a good idea to read a few Pluralsight reviews first and even then you should pay attention to what the service is supposed to do for your business and your employees. Do you require an easy and straightforward service with only basic features? Will you really use the advanced tools needed by experts and large enterprises? Are there any particular features that are especially practical for the industry you work in? If you ask yourself these questions it will be much easier to find a solid app that will fit your budget. We realize that when you make a decision to buy Learning Management System - LMS it’s important not only to see how experts evaluate it in their reviews, but also to find out if the real people and companies that buy it are actually satisfied with the product. That’s why we’ve created our behavior-based Customer Satisfaction Algorithm™ that gathers customer reviews, comments and Pluralsight reviews across a wide range of social media sites. The data is then presented in an easy to digest form showing how many people had positive and negative experience with Pluralsight. With that information at hand you should be equipped to make an informed buying decision that you won’t regret. What are Pluralsight pricing details? What integrations are available for Pluralsight? Pros: When it comes to knowledge, Pluralsight offers a wide base for learning. Anything emerging in the tech world this tool has it. It keeps you up to date with what is new in technology through learning. I can learn and be sure that I am abreast with the current topics and developments in the technology industry. Cons: The video learning materials are a good way to impact knowledge. However, you can have a series of videos explaining a particular topic but not in a single thread. This means that you have to look for other videos to help you complete your learning. It can be hectic to identify which video follows the other. It would be better if all videos for a single topic are found in a single thread for effective learning. Pros: At Pluralsight, they are not short of content and other learning materials. You can find anything that is related to technology in their database. You can lead a broad range of tech courses on their platform. The instructors are experts in their fields and thus you are in good hands. Cons: Although they update their courses as changes come by, some practices or courses may be out of date. It is thus better to first visit the comments below the courses before you proceed to take one. This will help you avoid wasting your time on an out of date course. If you need more information about Pluralsight or you simply have a question let us know what you need and we’ll forward your request directly to the vendor.